Visual inspection is often a first step in identifying key features of data. The high dimensionality of biological data sets prohibits an intuitive understanding and requires advanced visualization techniques. Our group develops visualization tools to support researchers in inspecting different types of biological data, e.g. for automatic tracking of cells in live cell imaging, displaying locations of SNPs on a caryogram, linking human cytomegalovirus drug resistance mutations to phenotypes, or visualizing the stability of selected gene subsets. Our heavily used VennMaster software provides algorithms to display area-proportional Venn diagrams of set intersections. L. Lausser, C. Müssel, M. Maucher, and H. A. Kestler. Measuring and visualizing the stability of biomarker selection techniques. Computational Statistics, 28(1):51–65, 2013. J. Huth, M. Buchholz, J. M. Kraus, K. Molhave, C. Gradinaru, G. von Wichert, T. M. Gress, H. Neumann, and H. A. Kestler. TimeLapseAnalyzer: multi-target analysis for live-cell imaging and time-lapse microscopy. 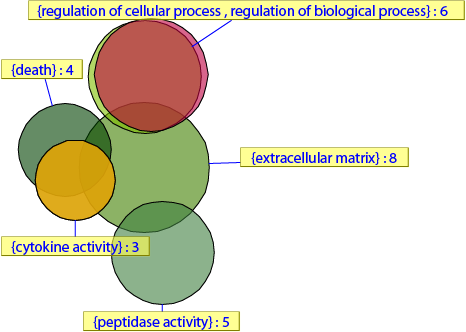 Comput Methods Programs Biomed, 104(2):227–34, 2011. M. Chevillotte, J. von Einem, B. M. Meier, F. M. Lin, H. A. Kestler, and T. Mertens. A new tool linking human cytomegalovirus drug resistance mutations to resistance phenotypes. Antiviral Res., 85:318–327, 2010. H. A. Kestler, A. Müller, J. M. Kraus, M. Buchholz, T. M. Gress, H. Liu, D. W. Kane, B. R. Zeeberg, and J. N. Weinstein. VennMaster: Area-proportional Euler diagrams for functional GO analysis of microarrays. BMC Bioinformatics, 9(1):67, 2008. A. Müller, K.-H. Holzmann, and H. A. Kestler. Visualization of genomic aberrations using Affymetrix SNP arrays. Bioinformatics, 23(4):496–7, 2007. H. A. Kestler, A. Müller, M. Buchholz, T. Gress, and G. Palm. A perceptually optimized scheme for vsiualizing gene expression ratios with confidence values. In E. André, L. Dybkjær, W. Minker, H. Neumann, and M. Weber, editors, Perception and Interactive Technologies (PIT 06), volume LNAI 4021, pages 73–84. Springer-Verlag, Heidelberg, 2006.